A guide from Far and Wild Safaris will collect you from the O R Tambo International Airport or from your overnight accommodation in Johannesburg and travel through the Highveld industrial, mining and agricultural areas. Our guide will make this section interesting, adding value with his interpretation of the local history and sights. The scenery is pretty flat but changes as we approach the Drakensberg Escarpment, where we drop down to the Lowveld through scenic passes. This Drakensberg Escarpment area has scenic vistas over the Lowveld of the Kruger National Park. The fresh mountain scenery and panoramic views over the Klein Drakensberg escarpment are quite spectacular and give the area its name of 'Panorama Route'. The geology and climate of this high rainfall plateau results in masses of waterfalls. Some are hidden deep within some of the largest man-made forestry plantations in the world, with row upon row of pine and eucalyptus trees. We will visit the Panorama Escarpment and some of the view-sites such as God's Window, Blyde River Canyon, Berlin and Lisbon waterfalls, etc. and overnight at Hannah Lodge (or similar). Hannah is a reflection of Africa in its entire natural splendour, a captivating tapestry of African sounds, smells and colours. The rising sun showers the valley with shades of pink, red and orange. Truly the flagship of the South African national parks, Kruger is home to an impressive number of species: 336 trees, 49 fish, 34 amphibians, 114 reptiles, 507 birds and 147 mammals. Kruger Park is an excellent venue with good sightings of lion, elephant, giraffe, zebra, wildebeest, warthog, baboon, monkey, hippo and impala regularly seen. The more elusive animals like leopard and wild dog are an exciting find. 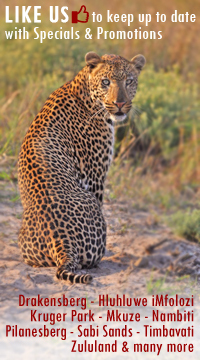 We will go on a sunset drive in an open safari vehicle on one of the evenings, this to enhance the possibility of seeing the nocturnal species such as leopard, lion, hyena, genet, bush babies and then the other nocturnal animals such as the smaller cats, owls and nightjars. These drives are conducted by SANParks, the organisation tasked with running this Park. After our morning game viewing we leave Kruger Park and travel to Swaziland. We visit the Ngwenya Glass Factory before making our way to Reilly's Rock (or similar). Situated in the Mliliwane Game Sanctuary, Reilly's Rock's unique lodge has been tastefully decorated in keeping with its colonial roots by Swaziland's leading conservation team. Notwithstanding the necessary subtle additions and renovations, the house still stands as it was built almost a century ago. Mliliwane Game Reserve is Swaziland's pioneer conservation area and is situated in a beautiful, secluded sanctuary in Swaziland's Valley of Heaven, the Ezulwini Valley, an area between Mbabane and Manzini. After breakfast we travel to Mkuze to check in to the Ghost Mountain Inn. At the foot of the legendary Ghost Mountain lies the privately owned Ghost Mountain Inn, a perfect setting for taking time out to relax and experience the charms of Africa in comfort and style. The Inn has 52 tastefully appointed, en suite bedrooms complete with television, telephone and air conditioning where one can take in the golden African sunset from your very own garden patio. This afternoon we will visit the Mkuze Game Reserve. A place of great beauty and high contrasts, Mkhuze is renowned as a mecca for bird lovers, with more than 420 bird species on record. The reserve has an astonishing diversity of natural habitats, from the eastern slopes of the Lebombo Mmountains along its eastern boundary, to broad stretches of acacia savannah, swamps and a variety of woodlands and riverine forest. Mkhuze Game Reserve constitutes the north-western spur of the Greater St Lucia Wetland Park a recently declared World Heritage Site. Animals to be found in the reserve include black and white rhinoceros, elephant, lion, giraffe, leopard, buffalo, nyala, blue wildebeest, warthog, impala, kudu and other smaller antelope. Rare species occurring are cheetah, hyena and suni. Visitors enjoy excellent animal and bird sightings from the hides in the reserve. This morning after breakfast we will travel directly to the "big 5" Hluhluwe uMfolozi Park where we would spend two nights at Hilltop Camp. The accommodation here is in a brick under thatch chalet, each bedroom with its own private bathroom/wash-basin and toilet. Each chalet is also equipped with a fridge. More game viewing follows as we leave the Hluhluwe uMfolozi Park to arriving in time for lunch in St. Lucia. We will check into our lodge and then visit the eastern shores of Lake St. Lucia, heading to Cape Vidal, game viewing all the while. After a visit to the beach we would continue on the circular route for a game drive before returning to our lodge. Animals that may be seen here include kudu, reedbuck, zebra, waterbuck and other antelope species, black and white rhino, elephant and on the odd occasion, leopard. We will overnight at Lidiko Lodge (or similar). Set above the St. Lucia Lake on a coastal dune, the main lodge offers bed and breakfast accommodation in well appointed air-conditioned en-suite garden rooms. All rooms offer a private patio and lead onto the tropical pool area and park like gardens of the lodge. After our two-hour cruise and lunch we make our way back to Durban, arriving late afternoon, where we drop you off at your overnight accommodation or at the King Shaka International Airport in time for your flight.